No, no, not me personally – but I did contribute to an Anthology that has just won an award. An award for Best Collected Work, no less! 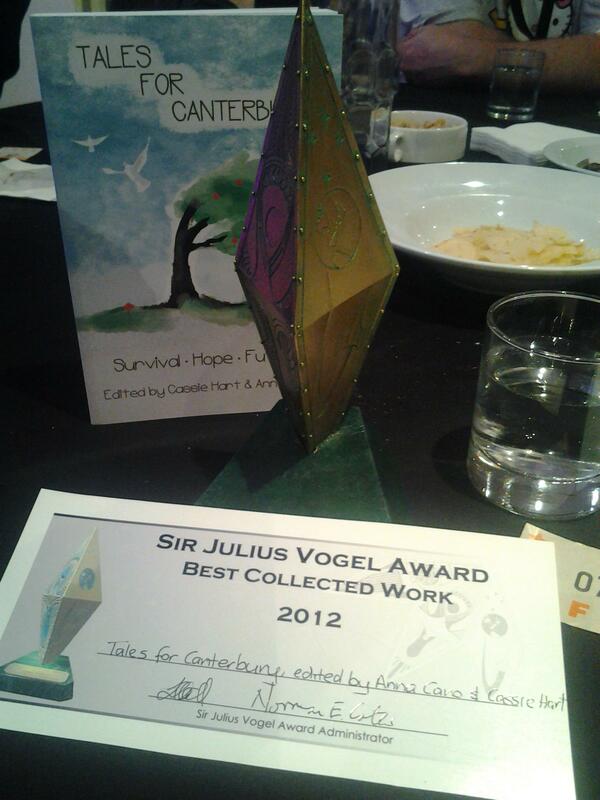 Tales for Canterbury was entered into the Sir Julius Vogel awards earlier this year. When it was nominated, we were all very chuffed about it, but never ever expected that it would actually have a shot at winning the award. But it did. It’s not that I don’t have faith… it’s just that it was up against some very big competition, and yet it still managed to pull through. Anna Caro and Cassie Hart pulled together this Charity Anthology almost in record time last year after the February 22nd Canterbury Earthquake. This meant sending out word to authors all over the place, reading through and accepting or rejecting work, then having the joy of editing it, and finally pulling it into a beautiful polished piece. Now as the crowning jewel, it has won the Sir Julius Vogel award for Best Collected Work. So… A huge congratulations goes out to all of my fellow authors in this collection, as well as to our amazing editors – Anna and Cassie. I feel very privileged to have worked with them to be published alongside this brilliant collection of authors. There are still a few copies of Tales for Canterbury left if anyone wants to buy one. But you only have until the end of June to get your hands on it. After that, Tales for Canterbury will be wrapped up and finished. So very happy for you, Leigh!